You may look at this puny wireless remote helicopter and scoff at its size. But don’t let that fool you – the Syma S107 may be small, but it’s a LOT of fun. The Syma S107 charges in 45-50 minutes via the controller or USB, and this gives you about 8 minutes of runtime. Let me tell you – this heli is crazy durable. I must have crashed it dozens of times these past 3 days, but *knock on wood* it’s still going strong. I’ve always wanted a radio controlled heli, but the prices were always a bit high. Small indoor electric models came out a few years ago, but the prices were still a bit high. At ~$32-35 shipped, this is a great toy, um, I meant adult stress reliever. 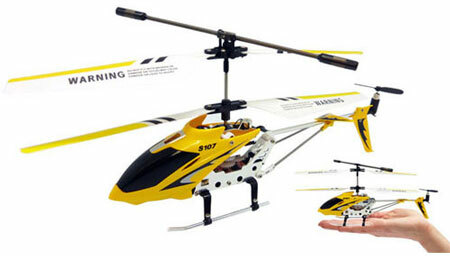 The heli in the link below features a random color (red, yellow, or blue) heli. If you have a color preference, you’ll have to spend a few dollars more. Just a heads-up – price dropped down to $20 today!